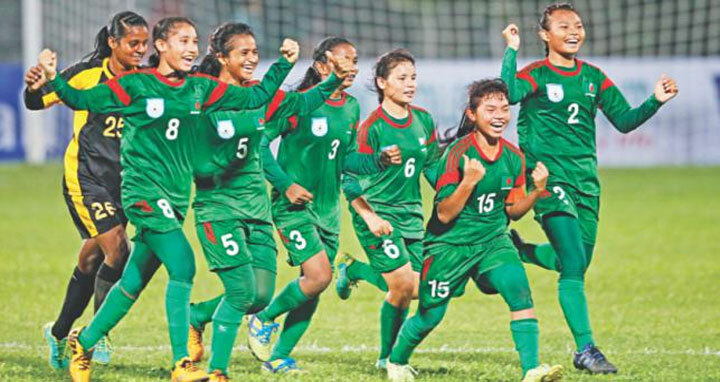 Dhaka, 31 Mar, Abnews: Bangladesh National U15 Women’s Team continue to deliver with another smashing win against Iran on Saturday. The Bengal girls thrashed the middle-eastern outfit 8-1 in their second match of the ongoing Jockey CGI Youth Football Tournament 2018 in Hong Kong. The team’s prolific performance binned the fact that Iran sit 44 steps ahead of Bangladesh in the FIFA rankings at 58 whereas Bangladesh are ranked 102. The Red and Greens took only a minute to open the score-sheet after the 9:30am (BDST) kick-off. Tohura Khatun netted the ball to give Bangladesh an early lead. Iran never looked like fighting back since conceding the early goal. After scoring the second in the 13th minute, Tohura completed her hat-trick in the 29th minute. Anai Mogini made it 4-0 in the 32nd minute. Shamsunnahar completed a five star first half performance by adding a fifth in the injury time before the break. The Bengal girls kept their foot down even after the break. The Red and Greens added two more on the 63rd and 69th minute before completing a 8-goal rout of Iran in the 77th minute. Iran, however, did manage to sneak in a consolation goal in the second minute of extra time. Skipper Maria Manda informed that the whole team is happy with the first two games and results and are eager for more. Bangladesh are soaring high in the tournament having beaten Malaysia 10-1 in their first match.